The 35.9m explorer sailing yacht Tara is visiting Paris as part of meetings, debates and film projections to promote solutions and marine policies needed to ensure a future for our blue planet. Tara is an explorer sailing yacht with an illustrious history. Built by the French yard SFCN in 1989 for the doctor Jean-Louis Etienne, she was especially designed by Luc Bouvet and Olivier Petit to be ice-resistant. Called Antarctica at that time, she participated in numerous expeditions in the poles where her curved aluminium hull allowed her to stay 'above' the ice. Later she was purchased by Sir Peter Blake, who renamed her Seamaster. The famous sailor also organised some scientific expeditions, until 2001 when the yacht was attacked by pirates at Macapa on the Amazon river. Two crew members were injured and Peter Blake was killed. Following this sad event, the schooner restarted activities in 2003 under the name Tara. Thanks to the initiative of the French designer agnès b. and Etienne Bourgois, she accomplished no less than eight expeditions in nine years around the world. The latest one was a first. Called Tara Oceans, this two-and-a-half year circumnavigation made a global study of marine plankton. Tara is a real floating laboratory. She accommodates 14 passengers in eight cabins, including a crew of seven. Her schooner rig has a sail area of 400sqm, and her twin 350hp Deutz engines give a top speed of 11 knots and a range of 5,000 nautical miles. The presence of Tara in Paris is a unique opportunity to visit this exceptional explorer sailing yacht, and to discover her past and future expeditions. 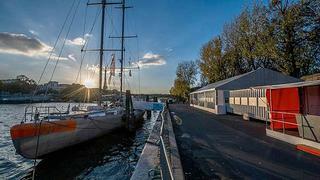 She will be moored near the bridge Alexandre III until 27th January 2013. Following that, in May, Tara will attempt to reach the Arctic Ocean via the northwest and northeast passages.